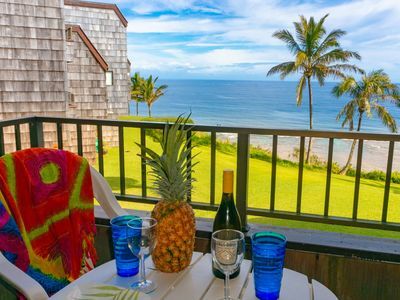 Casa Kauai is located on an extremely private bluff property with spectacular views of the ocean, framed between classic tropical foliage. 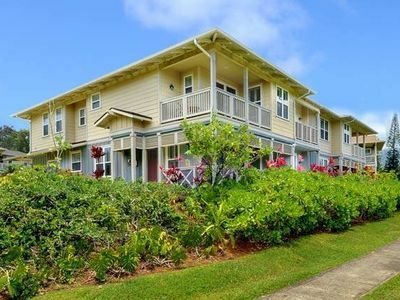 Address is 3560 Kaweonui Rd., Princeville, HI 96722. Only a beautiful greenbelt separates the house from the ocean. 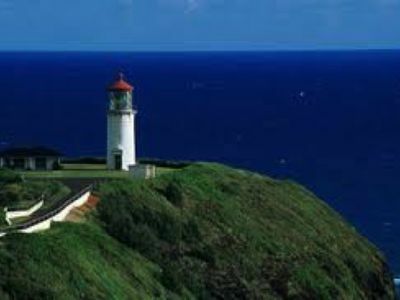 Unobstructed head-on views of the ocean. Whale watching and sunsets are glorious. You can walk to Hideaways beach in 15 mins or drive there in 3 minutes. You can hike down to Sealodge Beach in about 10 minutes. You can drive to many north shore beaches in 15 minutes. 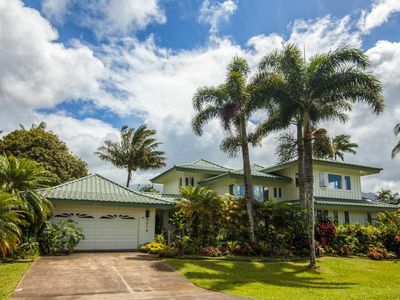 Large and well built, this (Robert Easton designed) tri-level home has four bedrooms and four bathrooms, an office (with amazing ocean view) plus a studio apartment with an additional bathroom. The house has exterior redwood siding and stained (weathered) cedar interior finishes. This is not an ultra-modern house with drywall interiors. So if that's what you're looking for, look at other ads. 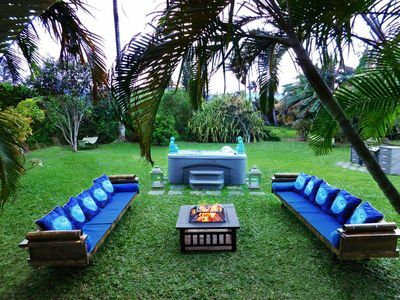 The feel of the house is that of a large family beach house. The interior is cedar wood, not spotlessly white drywall. 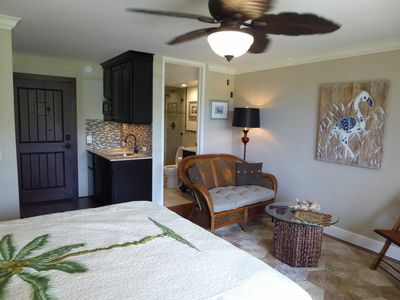 But,you can enjoy daily saunas, while surrounded by a beautifully landscaped garden. 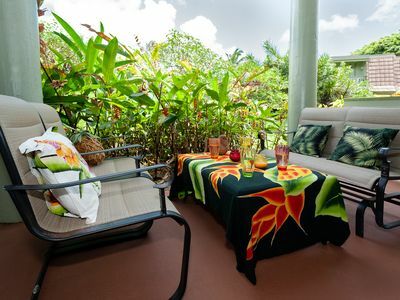 There are two decks and a lanai. 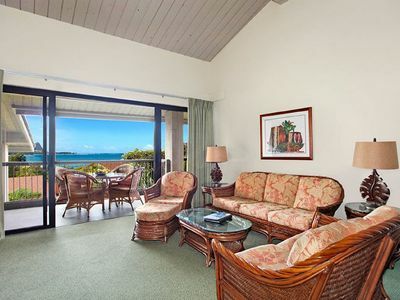 Watch spectacular sunsets over the ocean from your living room or decks. Mornings are gorgeous here, and the summer sunsets are truly awesome. 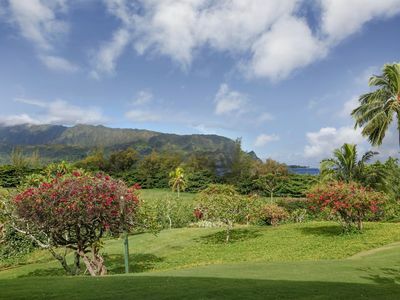 This house is about three minutes away from the beautiful St. Regis (formerly the Princeville Hotel), where fine dining and beach access are available to the public. 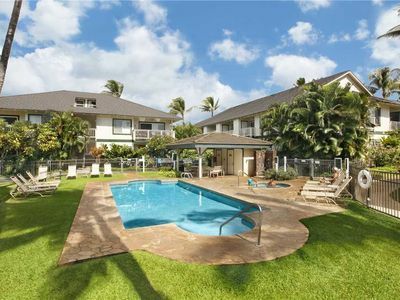 Situated in the lush north shore of Kauai, the house is an easy drive to many north shore beaches, great for kids, swimming and picnics, and a range of water sports including snorkeling, scuba diving, surfing, kayaking, shelling, etc. 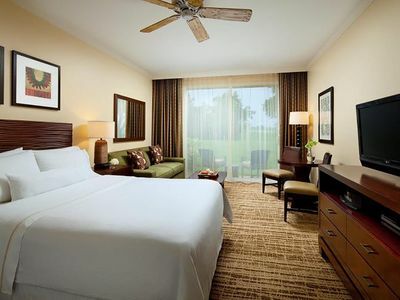 Tennis courts and golf are about two minutes away. 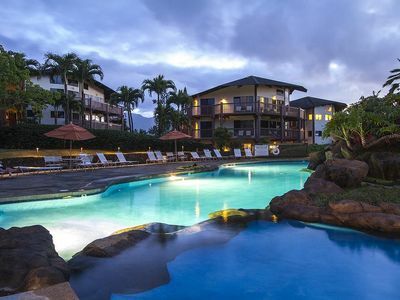 The Princeville Spa is about five minutes away. Stores and food shopping are no more than five minutes away. 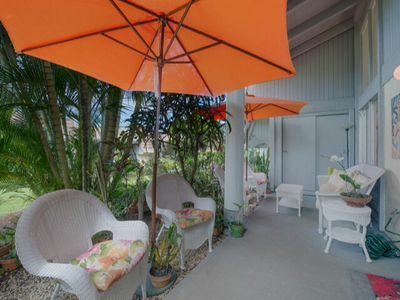 The main floor, which includes a bedroom, two bathrooms, kitchen, living room, and dining room is accessible using portable ramps that are maintained at the house. The house has a driveway that is accessible for a van. One ramp is used to drop down two steps to get from the grade (parking) level to the house's main floor level. A second indoor ramp is used to move from the dining area into the living room area. 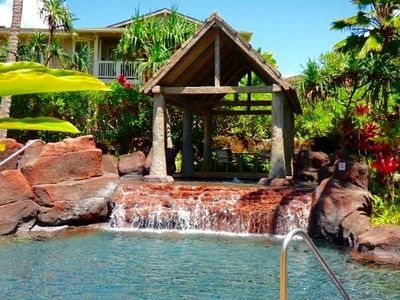 Beautiful Balinese style house with Hot Tub & AC! 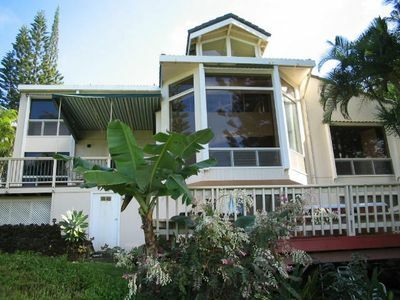 Desirable Queen's Bath area! 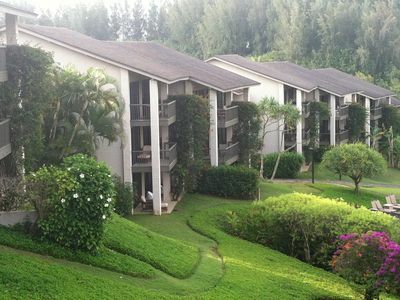 Retro Kauai!Newly Remodeled-Secluded Condo- Walk to Private Beach! Bikes&Boards! Low rates! ! 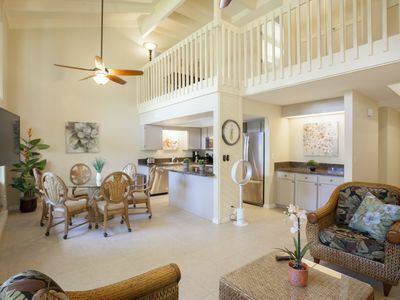 Bright & Airy Tropical Garden Setting Town-home. 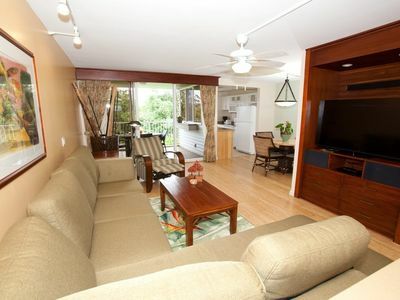 Hanalei Bay Resort #81012: Great North Shore location with views and AC! 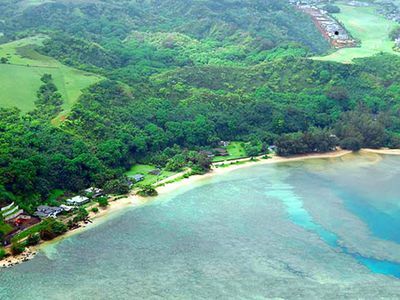 Puamana 25B: Walk to Anini beach. Spacious, updated, affordable. 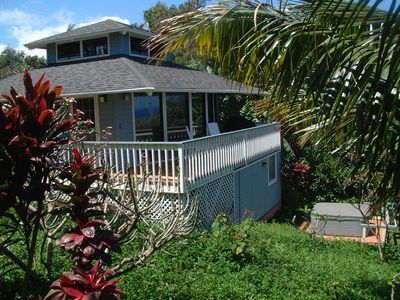 Beautiful 4 Bedroom Villa above Anini Beach! 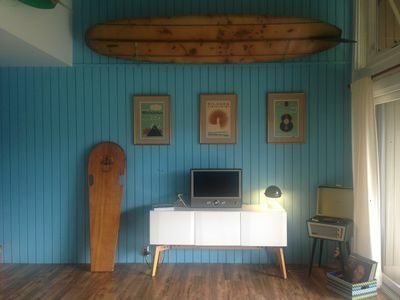 Top floor, cute decor, beach gear, amazing oceanfront view! !